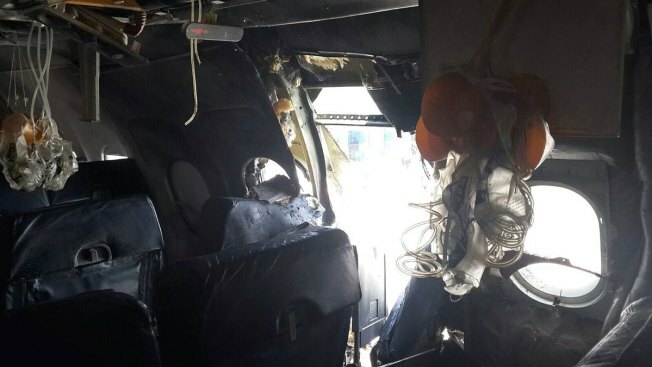 A view of an airliner after an explosion aboard Daallo Airlines Airbus flying to Djibouti, on February 2, 2016. The airliner made an emergency landing after take off from the Mogadishu International Airport. Somali officials have released closed circuit television footage from inside Mogadishu's airport which shows two men handing what looks like a laptop computer to the suspected suicide bomber who nearly downed a Daallo Airlines flight, NBC News reported. The hand-off happened after the suspect had already passed through security and at least one of his alleged accomplices appeared to be an airport worker, Somali government spokesman Abdisalam Atto told The Associated Press. The bomber — identified by the Somalis as 55-year-old Abdullahi Abdisalam Borleh — was blown out of the plane at 11,000 feet by the blast last week after the pilot of the stricken plane was able to bring the plane safely back to Mogadishu.